Theodore de Bruyn’s Making Amulets Christian is a comprehensive introduction to textual amulets from late antique Egypt. Although many of the topics discussed in the book could shed light on ritual practice elsewhere in the Mediterranean world, de Bruyn limits himself to Egypt because this is where the bulk of textual amulets from this period are found. De Bruyn sets out to answer three questions: 1) How did the form and practice of amulets change as the Christian church grew in prominence in Egypt throughout late antiquity? 2) What can the Christian elements in these amulets tell us about “the cultural and social location” (p. 2) of those who produced them? 3) And to what extent did Christian rituals such as daily prayers, liturgies, and exorcisms influence these incantations and amulets? De Bruyn addresses these questions in six richly detailed chapters. In chapter one, “Normative Christian Discourse,” de Bruyn surveys the range of polemics that early Christian writers leveled against “magicians” and “magic.” The chapter is organized chronologically. De Bruyn first cites second- and third-century figures such as Tatian, Justin Martyr, Origen, Irenaeus, and Tertullian before turning to later figures like Athanasius, Basil of Caesarea, and Augustine. These writers in one way or another decry “magic” or “sorcery” as foolish, fraudulent, heretical or demonic. The chapter aims to illustrate what de Bruyn calls the “slippage” (p. 18) between idealized and actual Christian conduct. Despite ecclesiastical authorities’ fulminations against these rituals, accusations of practicing magic formed a discourse of idealized Christian behavior that did not necessarily reflect the reality on the ground. The papyrological evidence that de Bruyn covers in subsequent chapters illustrates that Christians, clergy and laity alike, participated in the production and use of amulets. Chapter two, “Materials, Format, and Writing,” is a practical introduction to the process of making amulets. De Bruyn surveys the materials used in amulet production (e.g. papyrus, parchment, metal, wood, potsherds, stone), the format of the writing, and the most common visual elements that appear on amulets (e.g. charakteres, crosses, staurograms, Christograms, nomina sacra). This chapter provides crucial background information that other treatments might have glossed over assuming their audience’s previous knowledge. Moreover, the chapter is useful in that it highlights the materiality of amulets. Although it is easy to focus on the “text” of textual amulets, de Bruyn’s keen focus on their materials and process of production reminds his readers that these were objects that humans manipulated and wore. Chapter three, “Manuals of Procedures and Incantations,” examines the scribal culture surrounding the collection and transmission of ritually powerful texts. De Bruyn analyzes a series of Greek and Coptic ritual manuals and miscellanies to illustrate how scribes worked as “compilers or purveyors” (p. 69) who collated pre-existing texts into larger collections. These scribes drew from a shared cultural repertoire of invocations and techniques that were viewed as ritually efficacious. De Bruyn goes on to say that the gradual appearance of Christian elements in these manuscripts shows that scribes started to recognize these elements as part of this shared repertoire. This chapter not only demonstrates the process of how these texts were transmitted but also how scribes exercised individual agency in selecting texts to include in their manuals. Throughout the book, de Bruyn regularly stresses the role of improvisation and agency in the production and application of amulets. Not only do these artifacts attest to a level of creativity from scribes but also from ritual specialists who crafted amulets from their own memory of rituals that they must have experienced as daily liturgies. De Bruyn’s analysis of this evidence joins an ongoing conversation among ancient historians on “lived ancient religion,” which has brought greater focus onto the individual and their lived experience in ancient ritual practice. Chapter four, “Scribal Features of Customary Amulets,” and chapter five, “Scribal Features of Scriptural Amulets,” are juxtaposed in order to illustrate the change and continuity of scribal practices as Christian elements worked their way into textual amulets. Chapter four focuses on amulets lacking Christian elements such as amulets that call on the Egyptian god Horus and deploy voces mysticae to protect the wearer against snakes and scorpions. De Bruyn also highlights phrases common across all amulets, Christian or otherwise, such as adjurations for fevers or other harmful entities to “flee.” Chapter five focuses on the appearance of scriptural passages in amulets such as Gospel incipits, Psalms, and the Lord’s Prayer, showing that some amulets lack “customary” features discussed in the previous chapter. These two chapters hinge on one of de Bruyn’s main themes: the differentiation between “customary” and “Christian” features. De Bruyn seems to use “customary” as a stand-in for “not Christian,” or at least, to refer to the common idioms and imagery found in amulets from the broader Greco-Egyptian culture such as vowel strings, charakteres, or voces mysticae. This decision is sure to spark some discussion. Scholars of early Christian magic have long debated how to categorize these rituals and objects. Putting aside the thorny issue of the term “magic” in the first place, others have asked to what extent can we even call these rituals “Christian?” (See Ra’anan Boustan and Joseph Sanzo, “Christian Magicians, Jewish Magical Idioms, and the Shared Magical Culture of Late Antiquity,” HTR, 110:2 (2017) 217-240). 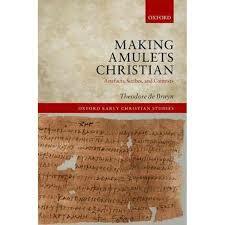 De Bruyn’s title itself, Making Amulets Christian, cleverly alludes to this debate while at the same time cautiously using the categories “customary” and “Christian” throughout. Chapter six, “Christian Ritual Contexts,” explores the Christian rituals alluded to in some amulets. Many amulets deploy Christian prayers and acclamations that were used in the daily liturgies of ecclesiastical institutions. The Sanctus, for example, the famous “holy, holy, holy” acclamation chanted during Eucharistic liturgies in late antique Egypt and elsewhere, appears on numerous amulets. Phonetic spellings in many of these amulets further suggest that the producers of these amulets encountered these invocations more often as oral pronouncements rather than written formulations. De Bruyn sees this as evidence of the rituals of ecclesiastical institutions “authorizing and maintaining specific ways of appealing to or associating with divine power” (p. 233). Overall, Making Amulets Christian is a valuable addition to this field that has something to offer everyone. Its introductory chapters, especially chapter two, would work well in a graduate level course on ancient magic. Moreover, with its numerous detailed analyses of specific amulets, the book can serve as a rich sourcebook of primary sources. Finally, de Bruyn’s contributions to the question of classifying these rituals and his focus on “lived ancient religion” and agency brings much to the table for future research. Andrew M. Henry is a Ph.D. candidate in Religious Studies at Boston University. His research focuses on magic and demonology in late antiquity.